1 and 2. This is the way the wines were shipped. 3. Tasting samples. 4. The tasting panel. 5. Jonas Tofterup MW. Photos courtesy of Jonas Tofterup. Is there a solid basis in the advice of many distributors and wine industry experts to wait a prudent time after wine has been shipped before pulling the cork? During transits, wine may be mainly exposed to temperature extremes, shocks and vibrations. In the case of air freight, pressure changes should be added; moreover, all goods transported by air must go through an x-ray security scan. High temperatures, which can be devastating for wine, have been widely studied and monitored. When it comes to vibrations and shocks, there is no doubt that packaging can make a big difference. With his research, Jonas Tofterup wanted to find out whether travel shock exists and whether it can be systematically identified; and if so, whether its effects disappear over time. In order to assess the impact of travel on the properties of wine, organoleptical and chemical analysis were performed. Viña Mayor Reserva 2012 from Ribera del Duero was the wine chosen for the research. It is made by Almudena Alberca MW, a colleague of Tofterup who became a MW in 2018. 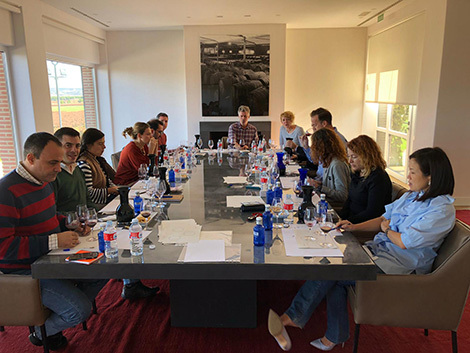 Both the tasting and the chemical analysis (with the exception of one part that was conducted at Dominio de Pingus’ lab) were carried out at the Viña Mayor winery in Quintanilla de Onésimo (Valladolid). This allowed to compare the wines that had been transported with samples that had never left the winery. A panel of 13 tasters was selected. All tasters were either Masters of Wine , MW students, DipWSET or Diploma students. Four different groups with 12 bottles each were arranged. The first was air freighted with UPS Express to Helsinki (Finland) and returned two months before the analysis and tasting. No temperature option was booked as this is the most common option chosen by wineries when air freighting samples. The second one was shipped from Viña Mayor to Copenhagen and was checked in as baggage on a return flight by Tofterup to be tasted two days after arrival. 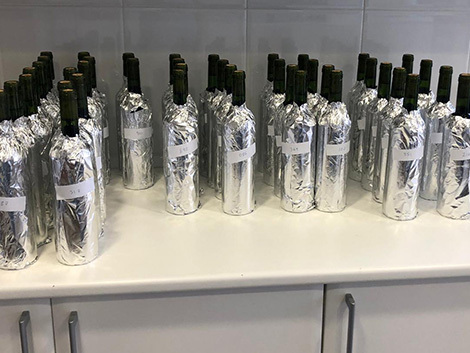 The third batch spent eight hours in the vehicle of a wine distributor during a delivery run. The wines were en route for 280km. The fourth batch were the control samples that stayed put in the winery. Air shippings involved additional road transport from the winery to the airport and destination points. When not being shipped, all wines were stored at 16-17 °C in the cellar of Bodegas Viña Mayor. 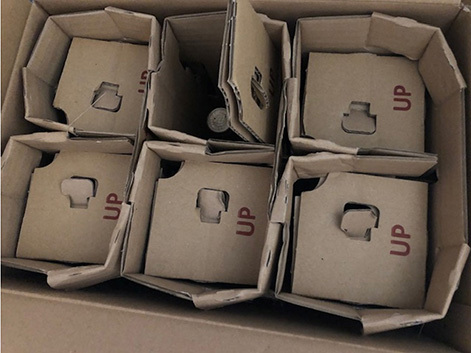 The same packaging was used in all cases in an attempt to replicate as closely as possible an actual shipment of quality wine: 7.8 mm thick cardboard boxes wrapped in aluminum bubble wrap that protects wine against temperature changes and reduces the risk of breakage. 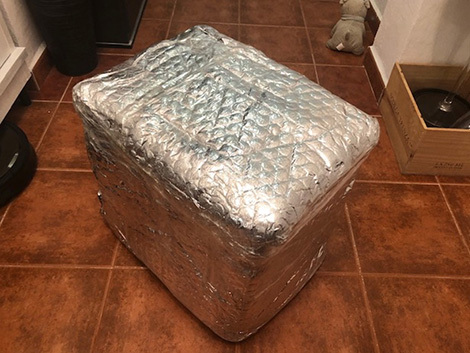 Each package contained a data logger to monitor temperature, shocks, atmospheric pressure and light, but not vibrations because there are no battery powered loggers capable of measuring these data. The day before the tasting, all wines were analysed for colour, total tannins, free sulphur dioxide and total sulphur dioxide —the main chemical components which could suffer after travelling. The tasting was performed blind in one session and included a test to ensure that tasters did not suffer from palate fatigue. Wines were served randomly. Producers and wine lovers might be glad to know that tasters could not detect a difference between transported wines and samples that had never left the winery. And this was despite the fact that bottles shipped to Helsinki had to travel longer and were exposed to more shocks and higher temperatures, in some cases above 25 º C.
The full-bodied red in the test, one of most common styles of wine in Spain, did not suffer from travel shock. According to these results, the recommendation to let wines rest after being shipped is not necessary in the case of reds with a certain structure (the research adds that results may have been different had another variety such as Pinot Noir or Garnacha been used). However, the results from the chemical analyses revealed something unexpected in the wines that had travelled by plane, particularly in the air freighted sample. Bottles in this group had significantly lower levels of free sulphur dioxide, which implies that a small amount of oxygen was absorbed through the cork. Furthermore, there was a slight loss of colour and the wine had evolved towards brownish tones. As none of these situations were reversible in time, “this may have a cumulative effect on wines that are shipped a number of times before being opened, and potentially provoke a state of accelerated oxidation,” explains Tofterup. Collector’s wines are likely to be the most affected as they may change hands regularly and be consequently shipped to their new owner. Wines bottled with low sulphur levels may also present an additional risk if they are submitted to frequent transits. The latest Spain-based wine professional to become a Master of Wine is 33 years old and has strong ties with this country. Born in Denmark, Jonas moved to Spain with his parents at the age of five and returned to his home country when he turned 13. 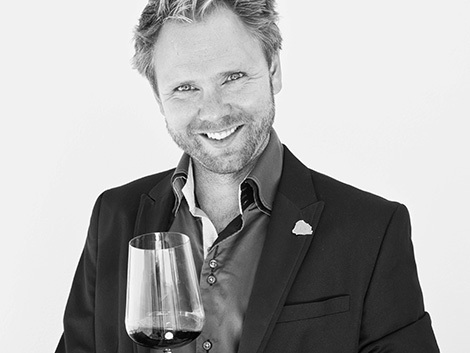 After studying oenology in France, Germany and South Africa, he returned to Spain in 2012 and started a career in wine. His first goal was to make a family wine (they called it Trenza, braid in English) in Yecla, alongside his father and brother. In 2015, when he was about to start his second year in the MW programme, Jonas decided to improve his knowledge of the business and sales side of the industry and started working as Europe export manager for Chilean producer Valdivieso Caballo Loco, a job that he still does today. At the same time, Jonas used to teach WSET courses, the prelude to the MW studies. He recently launched his own certified training centre, called Iberian Wine Academy, in Malaga, where he lives. For Jonas, the hardest part of the MW programme was not to juggle his studies with his new job, but to "learn to write an essay the British way". We thank the Institute of Masters of Wine and Jonas Tofterup for sharing the conclusions of this research paper with Spanish Wine Lover.